In her first novel for middle-grade readers , bestselling author Alice Hoffman tells a bewitching story of love and friendship that is truly magical. Twig lives in Sidwell, where people whisper that fairy tales are real. After all, her town is rumored to hide a monster. And two hundred years ago, a witch placed a curse on Twig’s family that was meant to last forever. But this summer, everything will change when the red moon rises. It’s time to break the spell. – A beautifully written middle-grade book, but the story was fairly simple. Twig and her mother live in the small town of Sidwell, where there are rumours of a monster lurking. Twig keeps the monster a secret – it’s her brother, James. Twig is forbidden to visit the new family next door who are descendants of the witch who cursed Twig’s family, but Julia becomes Twig’s best friend, and Julia’s sister Agate starts falling for the strange boy in the shadows. Alice Hoffman is the author of many successful books for adults including Practical Magic and more recently, The Museum of Extraordinary Things, a historical story I heard great things about (but haven’t got to read yet!). This is her first children’s book, and I can’t help feeling that she’s aimed a little low in the age group here. Nightbird is a very beautiful love story, told from the point of view of a twelve-year-old girl. 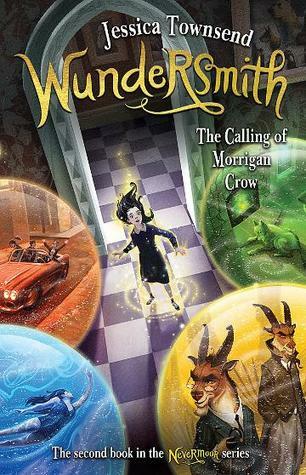 The romances and underlying stories are hinted at in Twig’s observations, and there’s plenty that an older reader might discover that a younger may not. The town of Sidwell, the Fowler’s house and orchard and the Mourning Dove Cottage next door really came alive for me, as did the descriptions of James flying over and through the woods. Unfortunately, the story was a little predictable. There were no big surprises and everything turned out so nicely in the end that I was expecting there to be a “happily ever after”. The kids just do a bit of herb mixing and a witches’ curse is undone. For early middle-grade readers, this level of complexity may be suitable, but I was left a little disappointed. You can’t just mess with magic and expect things to turn out exactly as you had planned! One thing this story does not lack is pie! There’s a gorgeous recipe for pink apple pie in the back of the book that I might actually have to try making sometime soon! Nightbird is an enjoyable, but fairly basic story, recommended for lower-middle-grade readers. Older readers will be charmed by the writing. I pretty much felt the same way as you. I enjoyed it, but if I was reading it at twelve I am sure I would have loved it. Rochelle Sharpe recently posted…Review: Nightbird By Alice Hoffman.